Somehow it seems as though news of this wedding and news from my mother’s church are related. First, the wedding. I rarely read wedding announcements but this one caught my eye. Maybe it was the sheep. Reading about this wedding was really great. Understand, this is from the perspective of a person who was not interested in marriage at all. I was not going to get married. Nor was I going to be all bridey. Certainly, no veil. Oh yes, the whole deal. Going on four years now. But the love story of these two people, strangers to me, strikes a chord. She’s a vegetarian editor of Edible Manhattan. He’s an upstate farmer. 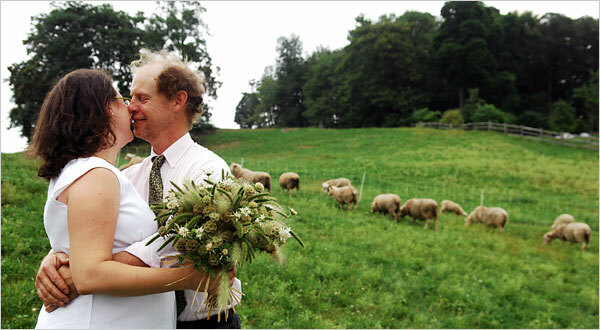 They married four months pregnant in order to time the birth with the farming cycle. He’s leaving to farm. To “pursue agrarian dreams.” Man. He’s becoming an environmentally minded sustainable farmer. This is a loss to my mother and her congregation, I know how much he has meant to her. Yet it speaks directly to the high calling that farming can be. Certainly, he is not the first person of faith to combine that with working the land. Polyface Farm is one example in the recent sustainability zeitgeist. The Amish farmers who supply wonderful food to markets bordering many urban and rural areas, are another. Finally, there’s the Catholic priest I learned of in the film event at Slow Food Nation. Rev. Christopher Hartley who has advocated on behalf of Haitians who are enslaved by the Dominican Republic sugar plantation owners is a powerful example of the best of religion. Too often we see examples of the worst. In The Price of Sugar, we see what can happen when the power of belief, of justice is used on behalf of good. Whatever one’s belief system is, the fact is that love, like farming, often requires patience and a bit of luck. Sometimes an intervention or two by well-meaning friends. Sometimes it’s pretty messy. The hours are long. A lot of work goes unnoticed but is no less important because it’s invisible. If we’re honest and tend to this “labor of love” thoughtfully and with care, good things can come of our work. Others’ lives can be improved by the simple fact of our attention to doing things in fair, right, and just ways. The best of what we are, the best of our character, is apparent in what we can offer our planet, our fellow human beings and if you believe, our higher power. How we do this tending of the earth, and of each others’ needs, makes all the difference in the world. I wish the best to Rev. Mark and to Gabrielle Langholtz and Craig Haney. I’m grateful to my husband who’s taught me a lot about the art of tending to love and who shares my appreciation of the good work farmers do. All these sorts of tending, nurturing activities are like farming. Hard work, and critically important work.